Once again my good friend Beefy comes through in a clutch? Is there anything this guy can’t do? 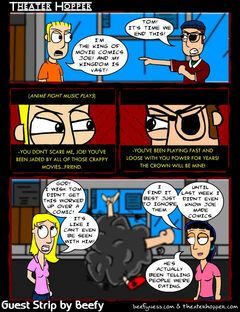 First it’s awesome nerdcore rap (found only at Beefyness.com) and now it’s guest strips! I guess I shouldn’t be too surprised. After all, he’s sent guest strips before. Don’t you think his art has gotten a lot better? I do! It never really occured to me the Joe from Joe Loves Crappy Movies and I would get into a dramatic showdown, but I suppose, like Highlander, there can be only one. But one thing Highlander didn’t have going for it were the patient wives standing off to the side while their immortal warriors tussled in a giant cloud of smoke, throwing up the devil horns. Thanks again to Beefy for the great strip. Remember that we’re doing a full week of guest strips. So if you missed the contribution of M.C. Man – the creator of The Adventures of Masked Cape Man – then his excellent comic is one click on the ‘back’ button away!